Is your company or organization interested in increasing its exposure through advertising while simultaneously supporting the arts in the Charlotte? If so, we invite you to buy an ad in our concert program for the season. Rates for advertisements are very affordable and come in a variety of sizes. For more information, please visit our Ad Sales page or contact our marketing team at ads@charlotteconcertband.org. All major credit cards accepted. Payments via bank account also supported. No prior account required. The payment processor will deduct a fee (typically 2.2% + $0.30) from your payment before we receive it. ​If you would rather have your full donation support the CCB you are welcome to mail your support to Charlotte Concert Band,1800 Camden Rd. Suite 107-219, Charlotte, NC 28203. Thank you for supporting the local music community through your generous donations to the Charlotte Concert Band. From 2000-2018, Queens University of Charlotte was one of our principal sponsors. Queens provided rehearsal and performance space, funded the conductor as an adjunct instructor, and provided an operating budget for music and administrative costs. Students at Queens University of Charlotte were able to play in the band for academic credit. Central Piedmont Community College: CCB retains and uses the CPCC band music library. CPCC housed the band during its early years. CCB benefits from a partnership with Restore Global. Restore Global has provided office equipment through their Access to Excess Program. We thank Restore Global and look forward to continued partnership. 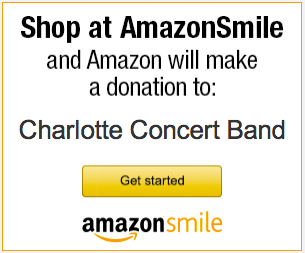 The Charlotte Concert Band is a non-profit 501(c)(3) organization. Our funding comes from grants, donations, and honoraria. Our goal is to serve all parts of the community through music, so we do not charge for concerts. We encourage patrons who are financially able to contribute and thus help ensure that the CCB continues to make great music for years to come. Your donations will allow us to purchase new music and percussion equipment, improve our marketing efforts, further develop our education outreach programs, bring in special guest performers, and perhaps even commission new concert band compositions or provide scholarships for young musicians in the area. If you are interested in donating to the Charlotte Concert Band, please go to our main page and give through our razoo page, click the donate button above or send us a message through our Contact Us section. Many employers sponsor matching gift programs which will match charitable contributions made by their employees. To find out if your company has a matching gift policy, contact your company's matching gift administrator (normally the Human Resources or Public Relations department). The impact of your gift may be doubled or possibly tripled, depending upon the company. Some companies will also match gifts made by retirees and/or spouses.